Introduction Evidence on the economic costs of physical inactivity and the cost-effectiveness of physical activity interventions in low-income and middle-income countries (LMICs) is sparse, and fragmented where they are available. This is the first review aimed to summarise available evidence on economics of physical activity in LMICs, identify potential target variables for policy, and identify and report gaps in the current knowledge on economics of physical activity in LMICs. Methods and analysis Peer-reviewed journal articles of observational, experimental, quasi-experimental and mixed-method studies on economics of physical activity in LMICs will be identified by a search of electronic databases; Scopus, Web of Science and SPORTDiscus. Websites of WHO, the National Institute for Health and Care Excellence international, World Bank and reference lists of included studies will be searched for relevant studies. The study selection process will be a two-stage approach; title and abstract screen for inclusion, followed by a review of selected full-text articles by two independent reviewers. Disagreements will be resolved by consensus and discussion with a third reviewer. Data will be extracted using standardised piloted data extraction forms. Risk of bias will be critically appraised using standard checklists based on study designs. Descriptive synthesis of data is planned. Where relevant, summaries of studies will be classified according to type of economic analysis, country or country category, population, intervention, comparator, outcome and study design. Meta-analysis will be performed where appropriate. This protocol for systematic review is prepared according to the Preferred Reporting Items for Systematic review and Meta-analysis for Protocols −2015 statement. Ethics and dissemination Ethical approval is not obtained as original data will not be collected as part of this review. The completed review will be submitted for publication in a peer-reviewed journal and presented at conferences. This is the first synthesis of literature on economics of physical activity in low-income and middle-income countries (LMICs). This study provides evidence-based recommendations for economic research practice on physical activity. This review presents evidence on the business case for physical activity interventions for decision making by policy makers in LMIC settings. This review could suffer from publication bias as it excludes studies that are not peer reviewed. This review focuses on studies written in the English language and could miss out on relevant literature published in other languages. Our scoping exercise did not identify any published reviews that address the economics of physical activity in LMICs. Thus economic evidence on physical activity in LMICs could be limited or scattered.13 Therefore, we designed this review to address the following research questions: (1) What is the available evidence base and research gaps on the economics of physical activity in LMICs? (2) What is the focus of and methods for underpinning economic research on physical activity in LMICs? (3) What are the target variables and cost-effective interventions for physical activity policy in LMICs? This review will add to the scientific literature, provide an overview of the economic evidence base of physical activity in LMICs and fill the gaps in the available evidence regarding this. Providing an up-to-date synthesis of the economic evidence base is an efficient way of highlighting current research practices and new findings to inform researchers, and formulation of cost-effective physical activity programmes and policies. Summarise available evidence on economics of physical activity in LMICs. Describe the focus and methods underpinning research on economics of physical activity in LMICs. Identify potential target variables and cost-effective interventions for physical activity in LMICs for policy formation. Identify and report gaps in research on economics of physical activity in LMICs to provide recommendations for the economic research agenda in LMICs. The methods for this review were informed by previous reviews of economic analyses of physical activity10 13–19 and are in line with recommendations on review of economic evidence.20–22 This will be based on the ‘Preferred Reporting Items for Systematic Review and Meta Analyses Protocols (PRISMA-P)’ Statement23 (online supplementary file 1). Physical activity interventions will not be specifically defined for this review in order to identify any physical activity intervention in LMICs. However, studies of which an economic analysis was carried out along with the intervention will be included in this review. This strategy will enable consolidation of all available evidence on economics of physical activity related to physical activity interventions. Eligibility criteria are determined by relevant elements of the population, intervention, comparator, outcome, study design (PICOS criteria).26 Interventions and comparators will be applicable only to intervention studies. Population: Any population in any age group across the life course. Intervention: Any physical activity intervention in which the economic evaluation of the intervention has been carried out. Comparator: Normal routine, no intervention. Outcomes: (1) Cost-effectiveness ratio, quality-adjusted life years (QUALY), incremental cost-effectiveness ratio assessed as the outcomes of physical activity interventions. (2) Cost of physical (in) activity in terms of healthcare cost and/or productivity loss and/or total cost of physical inactivity. (3) Measures of association of any economic variable with physical activity are defined as the primary outcomes of this review. Study design: Observational studies (cohort, case control, cross-sectional); correlational studies, experimental studies including randomised controlled trials; quasi-experimental studies; natural experiments; and economic evaluation studies. Studies reported only in the English language. Case reports, case series, letters to the editor, editorials, reviews, qualitative studies, unpublished theses, conference abstracts and any unobtainable texts. Studies published in a language other than English. The selection of databases was performed by a scoping review of methods of systematic reviews in the field.13 17 18 27 28 We will search the following electronic databases to identify studies: Scopus (covers 100% MEDLINE coverage, 100% of EMBASE coverage and 100% of Compendex coverage29), Web of Science and SPORTDiscus. Websites of WHO, National Institute for Health and Care Excellence (NICE) international and World Bank will be searched for relevant studies. The reference lists of included studies will be searched for any relevant articles. Searches will include publications up to December 2017. The search strategy was developed based on the scoping review that covered relevant reviews on economic studies on physical activity,10 13–19 reviews on physical activity27 30 31 and reviews on economic evaluations.28 32 33 The draft search strategy was then reviewed by subject experts and a subject liaison librarian to optimise the sensitivity and specificity of the search. Online supplementary file 2 shows a sample search strategy. A two-stage approach involving three independent reviewers will be used to select relevant papers. At the first stage, two reviewers (PDR and NKA) will independently screen the titles and abstracts of identified papers. Disagreement will be resolved through discussions with a third reviewer (SP). We will include a study if in doubt about its inclusion. For example, if the country setting of a study is unclear in the title and abstract, we will take it forward to the next stage. At the second stage, the full text of papers selected from stage 1, will be reviewed independently by two reviewers (PDR and NKA). Selected and excluded papers, with reasons, will be discussed by the two reviewers and a third reviewer (SP) at a consensus meeting and disagreement will be resolved by real time consensus. Corresponding authors will be contacted via email for clarification if needed. The study selection process will be presented in a PRISMA flow chart34 along with the reasons for the exclusion of studies. Endnote X7 software will be used to manage the search results. Data extraction will be performed using a standardised pilot-tested data extraction form developed based on relevant data extraction forms from relevant reviews.17 35 36 The adaptation process involved matching the review objectives with the available data extraction forms. Data from the final selected full-text articles will be extracted by one reviewer (PDR). To ensure quality of data extraction, a second reviewer (NKA) will independently extract data from a random selection of 50% of the final articles. Disagreements between the two reviewers will be discussed and resolved through discussions with the third reviewer (SP). Any unresolved disagreements will be reported in the final report. Online supplementary file 3 shows the draft data extraction form. Data will be extracted for the following items: general information, characteristics of the study, characteristics of the population/condition/intervention, data sources/data analysis/outcomes, conclusions and the way forward suggested by the authors, challenges and quality assessment. Risk of bias will be assessed by a one reviewer (PDR) for all the selected articles using standard checklists based on the study design. A second reviewer (NKA) will also independently assess the risk of bias on 50% of the randomly selected articles included. The Drummond checklist41 which consists of 35 items will be used. It mainly assesses the quality of the study in relation to methods, study design, data collection, data analysis and interpretations. If an economic evaluation study is based on a decision analytical model, the Phillips42 checklist will be used in addition. The Larg & Moss checklist43 will be used to assess the quality of the study. It would assess the possible biases related to the analytical framework: what costs should have been measured, methodology and data; how well were resources used and productivity losses measured including representativeness of data for the study population, analysis and reporting. Both internal validity and external validity will be appraised. The checklist recommended by NICE44 will be used. Risk of bias related to sample selection, method of selection of exposure/comparison group, outcomes and analysis will be assessed. Both internal and external validity will be appraised. Economics of physical activity (PA) in low-income and middle-income countries (LMICs)—plan for data extraction and the quality assessment process. NICE, National Institute for Health and Care Excellence. Good quality (++): almost all checklist criteria have been fulfilled; where they have not been fulfilled the conclusions are very unlikely to alter. Moderate quality (+): some of the checklist criteria are fulfilled; where they have not been fulfilled or not adequately described, conclusions are unlikely to alter. Low quality (−): few or no checklist criteria are fulfilled, and conclusions are likely or very likely to alter. The quality of the included studies will be reported and critically appraised for each study. However, studies will not be excluded based on quality, as this review is particularly aimed to capture the evidence base on economics of physical activity in LMICs and appraise the methods underpinning the evidence base. A descriptive synthesis of data is planned due to the expected heterogeneity of the studies. Summaries of studies will be classified according to type of economic analysis, country or country category, characteristics of the study by PICOS criteria (where applicable); population, intervention, comparator, outcome, study design and quality of studies to describe the overview of available economic evidence base of physical activity in LMICs. Where the numbers permit, summaries of the studies will be categorised based on the focus of the study; economic burden of physical inactivity, economic analysis of physical activity interventions, economic correlates of physical activity including association of physical activity and cost (healthcare cost and/or productivity loss). Where appropriate, we will conduct a meta-analysis to quantify the effect sizes. Such analyses will adjust for between-study heterogeneity using random-effects models. The I-squared (I2) statistic will be used to evaluate the heterogeneity related to the findings of the papers. Quantitative analysis will be conducted using STATA V.13 software. We will report the number of studies where data extraction items were not applicable, as an indicator of the quality of reporting. Author-stated limitations of included studies and recommendations for future research and policy will be presented. This review will be reported in accordance with the PRISMA 2009 statement.34 The study selection process will be illustrated by a flow diagram that will include the reasons for exclusion of studies at each stage. The search strategy, data extraction forms and quality assessment tools will be published as online supplementary files. This protocol will not be amended and any changes will be described and discussed in the final report. A scoping review of economics of physical activity in LMICs was carried out in November 2017 to inform the methods of the current review. It identified systematic reviews conducted on economics of physical activity and the gaps in knowledge. It has not been submitted for publication. A review of economics of physical activity in LMICs was designed and methods were developed in December 2017. The search strategy was piloted in January 2018 and the protocol was developed in February 2018. The first submission of the protocol for peer review was on 1 March 2018. Data collection will be commenced upon approval of the protocol for publication and will be completed in 2 months. Patients and public are not directly involved in this study as original data will not be collected. Best practice guidelines to conduct systematic reviews33 will be followed. The level of physical inactivity of the population in LMICs is likely to increase giving rise to a multitude of public health and economic consequences, including rising healthcare costs due to increased NCD-related treatments, increased DALYs and productivity losses. Economic research on physical activity from the perspective of LMICs should therefore be considered a priority. This is because increased physical inactivity leads to uncontrolled healthcare needs in LMICs, where resources (including that for healthcare) are limited and often shrinking in real terms. Pooling of the available research evidence on economics of physical activity in LMICs will thus reveal the current knowledge on economics of physical activity in LMICs, thereby guiding the future of national, regional and local policies around physical activity. This will be the first study to review the evidence base on economics of physical activity in the context of LMICs which can be considered as the main strength of this study. This will identify gaps in knowledge to support future studies in this area. However, we will only include those studies that are published as peer-reviewed articles and are published in the English language. Thus, possibility of publication bias and language bias cannot be excluded. Furthermore, by assessing and reporting the quality of included studies using standard quality assessment checklists, the possibility of reporting bias of this review can be minimised. WHO is in the process of drafting the ‘Global action plan on physical activity (GAPPA) to be implemented from 2018 to 2030’.45 This is a timely study as the evidence from this research will provide useful information for implementation and prioritise the actions of GAPPA in LMICs. Evidence from this research will be useful for policy makers and stakeholders dealing with physical activity promotion at individual, local, national, regional and global levels, with special reference to LMICs. Further, this review will be an important base for a research agenda on economics of physical activity in LMICs. This will be a useful guide for researchers to design research on economics and physical activity with sound methodology, based on the research needs of LMICs. Furthermore, information gathered from this research will guide funding agencies for effective allocation of resources. World Health Organization. Global recommendations on physical activity for health. Geneva: World Health Organization, 2010. World Health Organization. Physical activity [Fact Sheet – Media centre]. 2017 http://www.who.int/mediacentre/factsheets/fs385/en/ (Accessed 6 Feb 2018).
. World bank country and lending groups: country classification. 2017 https://datahelpdesk.worldbank.org/knowledgebase/articles/906519-world-bank-country-and-lending-groups (Accessed 1st Dec 2017). WHO. Prevalence of insufficient physical activity among adults, data by world bank income groups. 2015 http://apps.who.int/gho/data/view.main.2487?lang=en (Accessed 29th Jan 2018). WHO. Global health risks: mortality and burden of disease attributable to selected major risks. ISBN 978 92 4 156387 1. 2009. Retrieved from http://www.who.int/healthinfo/global_burden_disease/GlobalHealthRisks_report_full.pdf (Accessed 25th Jan 2018).
. A systematic review of economic analyses of active transport interventions that include physical activity benefits. BMJ Open 2016;45. NICE. The guideline manual process and methods (PMG6): NICE, 2012.
. Preferred reporting items for systematic review and meta-analysis protocols (PRISMA-P) 2015 statement. [Research Support, Non-U S Gov’t Research Support, U S Gov’t, P H S]. Syst Rev 2015;4:2046–4053. WHO. Physical Activity. [Fact sheet]. 2018 http://www.who.int/en/news-room/fact-sheets/detail/physical-activity (Accessed 15th Jan 2018). WHO. Global Strategy on Diet, Physical activity and Health. 2018. Retrieved from https://www.who.int/dietphysicalactivity/pa/en/ (Accessed 6th Oct 2018). University of York. Systematic reviews: CRD’s guidance for undertaking reviews in health care . York: University of York, 2009.
. Preferred reporting items for systematic reviews and meta-analyses: the PRISMA statement. [Guideline Research Support, Non-U S Gov’t]. J Clin Epidemiol 2009;62:1006–12.
. Potential economic impacts from improving breastfeeding rates in the UK. [Research Support, Non-U.S. Gov’t]. Arch Dis Child 2015;100:334–40.
. Cost-of-illness studies: a guide to critical evaluation. [Research Support, Non-U S Gov’t]. Pharmacoeconomics 2011;29:653–71. National Institute for Health and Excellence (NICE). 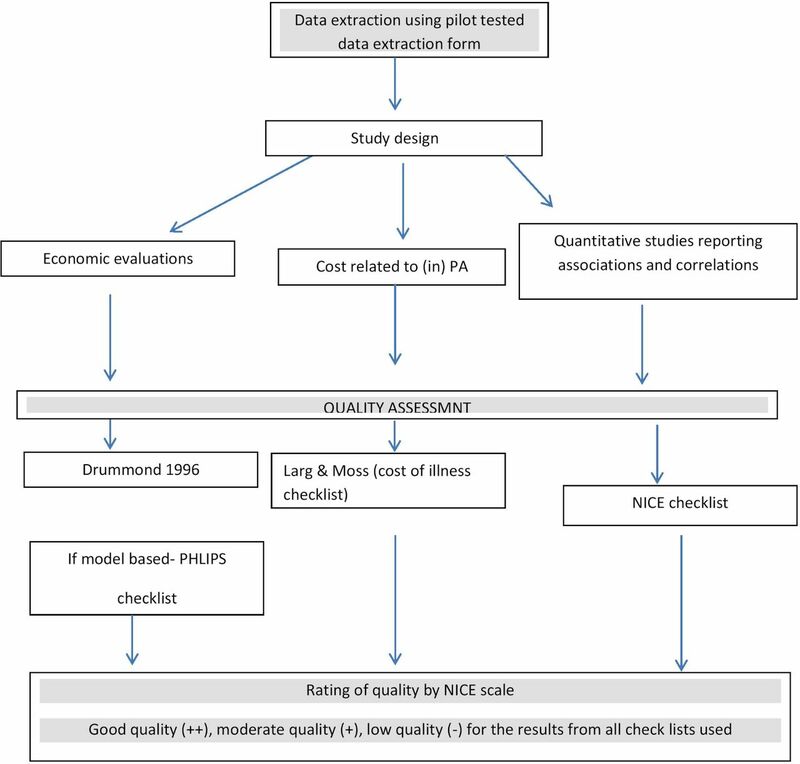 Methods for the development of NICE public health guidance (third edition), Appendix G Quality appraisal checklist-quantitative studies reporting correlations and associations. 2012 https://www.nice.org.uk/process/pmg4/chapter/appendix-g-quality-appraisal-checklist-quantitative-studies-reporting-correlations-and (Accessed 2nd Jan 2018). World Health Organization. Non communicable diseases and their risk factors, governance: Development of draft global action plan to promote physical activity, 2018. Contributors SP and NKA developed the idea for the review with inputs from PDR. PDR wrote the first draft. SP and NKA revised the protocol. NKA will act as guarantor of the review.